Slow cookers are the perfect appliance to help those who work long hours be able to come home to a hot healthy meal. 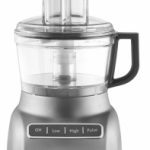 There are many people who search exclusively for Hamilton Beach slow cookers when looking for one of these small appliances to meet their needs. In order to help you find the right Hamilton Beach slow cooker to meet your needs, we have put together a review of the most popular slow cookers bearing this brand name. The fact that this review only covers Hamilton Beach slow cookers is due to the fact that many searchers are looking for this specific brand. We are in no way promoting this brand over other brands, and in fact, we will be offering a review of other companies slow cookers at a later date. Hamilton Beach is an American manufacturer of air purifiers, home appliances, and restaurant equipment. The company was founded in 1910 by Frederick Osius, who did not want to name the company after himself, so he paid two of his employees $1000.00 dollars each for the use of their last name, and thus the Hamilton Beach brand was born. Today, the company is a household name in many American homes, and continues its legacy of producing a number of highly functional kitchen appliances. The Hamilton Beach 33967 Set ‘n’ Forget Slow Cooker is perfect for those people who are looking for a slow cooker with all the bells and whistles. 3 cooking options for a better cooking experience. Program: set the amount of time you want the food to cook and then forget about it until it’s time to eat. Once the time expires, the slow cooker automatically resets itself to keep warm. Probe: Just insert the probe and set the slow cooker to the internal temperature you want your meat cooked to. Manual: gives you a choice of selecting high, low, or warm temperatures. The Hamilton Beach 6 Quart Programmable Slow Cooker is nice looking and has a lot of features that will help to make meal preparation a snap. The meat probe is great, especially for beginning cooks, as it helps them ensure that no undercooked meat reaches the table. Reviews for the Hamilton Beach 33967 Slow Cooker are good. While most customers seem to like this slow cooker and get a lot of use out of it, some customers did express having a problem with the slow cooker suddenly shutting off for no apparent reason. While it is likely that this is a problem with a few individual appliances, there were enough complaints about this happening to make it worth noting. However, the majority of customers found they had, and continue to have, a very good experience with the 33967. The Hamilton Beach Stovetop Slow Cooker is designed to truly make cooking in this one appliance a one pot cooking experience. The aluminum insert allows you to brown your meat right in the insert, and then set it into the slow cooker and add the other ingredients, making it possible to truly make one pan meals. You can also use the insert directly on the stove for making soups as well. Reviews for this Hamilton Beach Slow Cooker are extremely good. The only problem most customers have with this appliance is the fact that the handles get extremely hot, so take note to have oven mitts or hot pads handy when handling this slow cooker. However, the handle problem seems minor to most people, as they found so many features they really like. The Hamilton Beach 33265 6-Quart Programmable Insulated Slow Cooker is slightly more expensive than many of the slow cookers in the Hamilton Beach line up, but the features of this slow cooker might make the few dollar price difference worth it. The Hamilton Beach 33265 is extremely attractive, being basically black with a bit of silver trim. The non stick insert that can be used right on the stove top will be a definite plus for many users. Reviews for the Hamilton Beach 33265 Insulated Slow Cooker are exceptional. If you are looking for a basic slow cooker that has a few extra features that makes transporting your slow cooker to special events easier, then the Hamilton Beach “Stay Or Go” Slow Cooker may be ideal to meet your needs. While this slow cooker is not programmable, it is an extremely nice basic slow cooker. The hinged lid and the lid lock makes this slow cooker easy to transport and use when serving straight from the slow cooker itself. Reviews for the 7 Quart Stay Or Go Slow Cooker are extremely good. 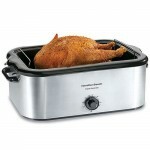 The Hamilton Beach 33969 Set And Forget 6 Quart Slow Cooker is another one of this company’s feature rich slow cookers. For those of you who can’t tell the difference between the Hamilton Beach 33967 and the 33969, don’t feel bad, as the only difference is that the 33967 comes with a spoon for stirring and serving that clips right on to the slow cooker, and the 33969 slow cooker does not have that one small feature. Otherwise, the two models are identical, right down to their sleek silver and black looks. Reviews for the Hamilton Beach 33969 are good. There are a few complaints worth noting. One is that some customers are finding that their slow cooker automatically shuts itself off and won’t restart. A problem that some of the programmable slow cookers by this company seem to have. The other complaint by some customers is that the rubber gasket leaves a smell and taste on their cooked food that they don’t like. If you are looking for a slow cooker that is small enough to make soup for just two people, and large enough to make food for guests or that church supper, then you will find the Hamilton Beach 33135 3-in-1 Slow Cooker a good choice, as this slow cooker has the right features to make dinner for a bigger variety of people. This is a very nice modern looking slow cooker, and the fact that it comes with three different vessels that allow you to simply and easily makes varying amounts of food, depending on your needs, is a real benefit that many users will find extremely useful. Reviews for this slow cooker are good. However, there are a small number of complaints all centered around the lifespan of this slow cooker. Several customers reported that their slow cooker quit working, either shortly after purchase or right after the warranty ran out. If you are looking specifically for a Hamilton Beach Slow Cooker to help you make those hot meals, even when you are away from home, one of these slow cookers may just be the one you are looking for.